In late January, China's maiden lunar rover experienced a "mechanical control abnormality" that Chinese officials feared could spell the end for the spacecraft. Now, a brief news dispatch published just hours ago by Chinadaily reports Jade Rabbit has been permanently lost. Above: Artist's concept of Earthrise at Mare Imbrium, Yutu's lunar landing site. Credit: CNSA/Chinanews/Ken Kremer/Marco di Lorenzo. The rover, also known as Yutu, and the Chang'e-3 lander were scheduled to emerge from a two-week lunar night on Monday, February 10th, but Yutu's earlier mechanical difficulties had prevented one of its solar panels from folding away to insulated safety for the frigid fortnight. 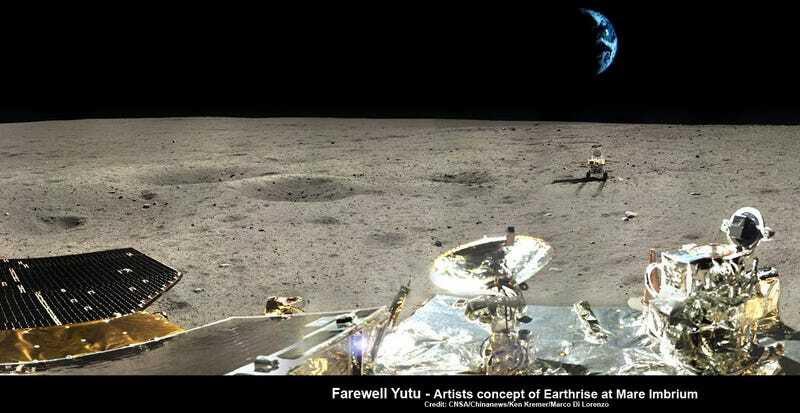 The moon's nighttime temperatures, which can reach close to -300 degrees Fahrenheit, were apparently too intense for Yutu's fragile components. The rover therefore froze to death, failing to wake and communicate with China's mission controllers on Monday, at the start of what would have been Lunar Day 3. The sun has fallen, and the temperature is dropping so quickly… to tell you all a secret, I don't feel that sad. I was just in my own adventure story – and like every hero, I encountered a small problem. Goodnight, Earth," Yutu said. "Goodnight, humanity. There's been no official word about China's Chang'e-3 lander, but it is expected to survive.